Criminal solicitors across England and Wales are to stage a two-day walkout at the end of the month to coincide with a strike by probation workers. 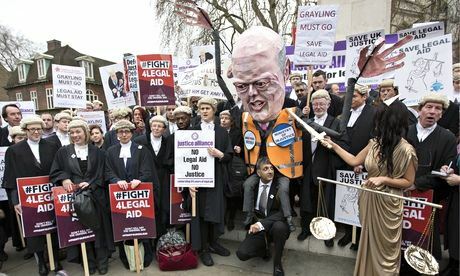 The lawyers' escalation of their industrial action, in protest at deep cuts to criminal legal aid fees, is aimed at intensifying pressure on the justice secretary, Chris Grayling. Both the solicitors, who are also launching an indefinite work-to-rule, and probation staff will take action on Monday 31 March and Tuesday 1 April, which is, coincidentally, Grayling's birthday. This latest walkout, the third since the beginning of January, is not being co-ordinated with barristers from the Criminal Bar Association. It is expected, nonetheless, to lead to widespread disruption of criminal cases in magistrates and crown courts. Solicitors have been careful to avoid describing the action as a strike because that would raise complex questions over their contractual obligations to the Legal Aid Agency. Fees for solicitors working in magistrates and crown courts and in police stations are being reduced by 17.5%, staggered over a year. Half the cut has already been imposed. In some cases, fee cuts are as high as 30%. The decision to launch a third round of direct action was taken at a meeting of 500 defence solicitors in Manchester on Wednesday. The National Association of Probation Officers (Napo) announced earlier this month that it would stage a 24-hour stoppage from midday on Monday 31 March. Probation officers, who work closely with solicitors in court, particularly when convicted defendants are sentenced, are opposed to the justice secretary's plans to outsource 70% of the service to private firms and voluntary groups. Nicola Hill, president of the London Criminal Courts Solicitors' Association, said: "We are standing by the probation service as they too face a dangerous overhaul and a risky, non-evidence-based, privatised rehabilitation agenda. "Throughout the criminal justice system we are seeing justice eroded. The Ministry of Justice and the courts have benefited from the goodwill of defence solicitors for many years. "Legal aid lawyers have been oiling the wheels of a creaking justice system for too long. We're no longer prepared or able to do this. That's why we'll be working to rule, sticking to the letter of criminal procedure. "This won't be to the detriment of clients, but will demonstrate to the MoJ that we've been taken advantage of for too long. Our hand has been forced." Bill Waddington, chair of the Criminal Law Solicitors' Association, commented: "Yesterday's decision is an indication of the anger and frustration about what the government is doing. "The fact that some 500 lawyers holding more than 700 legal aid contracts took the trouble to drop everything at very short notice, to make their views heard, shows we are at the end of our tether and not prepared to put up with this any longer. "We've been trying to persuade the MoJ for 12 months that the approach is both wrong and damaging . They don't wish to hear what we have to say or, if they do hear it, they're not listening. "The work-to-rule is the start of our campaign to ensure that the CPS complies with every requirement and, if they don't, there'll be more delays and additional costs. We intend to withdraw every act of goodwill, which at the moment we provide by the bucket-load to keep the system from collapsing. That will now stop." The MoJ is cutting £215m out of the annual criminal legal aid budget. It maintains that the UK's legal aid budget is about £2bn a year, making it "one of the most expensive legal aid systems in the world", and says it "would remain very generous even after reform". Grayling said last month: "This government is dealing with an unprecedented financial challenge and I have no choice but to look for the savings ... I cannot exempt legal aid but that doesn't mean I don't understand how challenging these reductions will be. I have spoken at length with solicitors and barristers about these reforms and listened closely to their views. The final package does mean fee reductions but it also includes a series of measures to ease their effect on lawyers." He added that the government would not "seek further savings from criminal legal aid".